Finance ministers and central bankers from the Group of 20 largest economies (G20) pledged over the weekend to not devalue their currencies to gain a competitive edge and to consult with each other more closely on monetary policy. The pledge comes after a previous lack of coordination on monetary policy among G20 countries and the failure of stimulus policies to spur growth in the stuttering global economy, according to analysts. "We will refrain from competitive devaluations and we will not target our exchange rates for competitive purposes," said a communiqué issued on Saturday following the two-day G20 meeting of finance ministers and central bank governors in Shanghai. Financial policymakers of the G20 economies also reiterated that they will consult closely on exchange rate policy, adding that excess volatility and disorderly movements in exchange rates can have adverse implications for economic and financial stability. 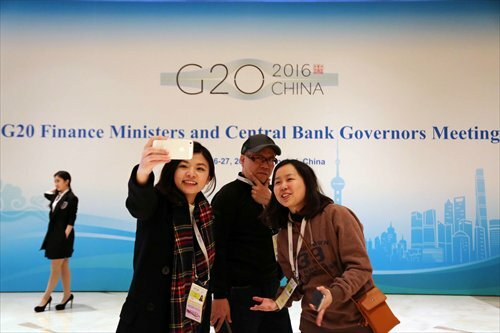 Exchange rates were a key topic at the G20 meeting because currency instability has caused turmoil in markets around the world, sparking concerns over the global economy, said Xiong Aizong, a research fellow with the Institute of World Economics and Politics at the Chinese Academy of Social Sciences. The message on the need for exchange rate stability is for all countries and not just China as some might suggest, even though the yuan exchange rate has been watched more closely since it became an international currency, Xiong told the Global Times on Sunday. Recent depreciation of the yuan against the US dollar has sparked concerns that the Chinese economy is still slowing. Some media reports have even suggested that China is deliberately allowing the yuan to fall to support exports. Top Chinese officials, including People's Bank of China Governor Zhou Xiaochuan, have repeatedly dismissed such speculation and maintained that the yuan will remain stable against a basket of currencies. "We will not use competitive devaluation to support China's exports," Zhou said at a press briefing in Shanghai on Friday, citing China's vast trade surplus of nearly $600 billion in 2015. Zhou also urged countries to increase communication and coordination on monetary policy to ensure stability. Lack of coordination on monetary policy is risky for economies and markets around the world, Jiang Yong, a research fellow at the China Institutes of Contemporary International Relations, told the Global Times on Sunday. "But substantial improvement in coordination is difficult because all these countries rely too much on monetary policy to support their own growth during this tough time in the global economy," Jiang said. The global economy continues to recover, but downside risks and vulnerabilities have risen, said the G20 communiqué, citing volatile capital flows, a large drop in commodity prices, escalated geopolitical tensions, the potential effect from a UK exit from the EU and a large and increasing number of refugees in some regions. "We will use all policy tools - monetary, fiscal and structural - individually and collectively to achieve these goals," said the communiqué. But it noted monetary policy alone cannot lead to balanced growth. Relying too much on using monetary easing to support growth could be risky as well as ineffective, because it could have a negative impact on other economies and could further darken the already gloomy picture for the global economy, Xiong noted. Xiong said other tools such as fiscal and tax policies could be effective for supporting growth and could ease the reliance on monetary easing. Financial policymakers also pledged to take measures such as structural reforms and investment to boost global demand, read the communiqué.